Greek glass alabastron, probably made in Italy in 1st/2nd century BC, and now part of the Campana Collection of the Musée du Louvre. This article is about the ancient type of pottery. For the as yet unidentified ancient Egyptian city, see Amarna#Name. 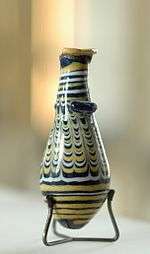 An alabastron (from Greek ἀλάβαστρον; plural: alabastra or alabastrons) is a small type of pottery or glass vessel used in the ancient world for holding oil, especially perfume or massage oils. They originated around the 11th century BC in ancient Egypt as containers carved from alabaster – hence the name – but spread via ancient Greece to other parts of the classical world. Most types of alabastron have a narrow body with a rounded end, a narrow neck and a broad, splayed mouth. They were often left without handles, but some types were equipped with ear-shaped projections or lugs into which holes were punched. Strings were then put through these holes for easy mobility. The design of the first Egyptian alabastra was inspired by the palm tree, with a columnar shape, a palm capital and a stand. Later designs were made from glass decorated with various patterns, such as scallops, festoons or abstract patterns of rings or zigzags. A basic Corinthian bulbous shape standing about 3–4 inches (76–102 mm) tall; a popular design found throughout Greece. A long and pointed version commonly seen in eastern Greek, Etruscan, and Italo-Corinthian pottery. An Attic type about 4–8 inches (10–20 cm) long with a rounded base and lugs for carrying purposes. Alabastra also appeared in many other places in the ancient world, notably Assyria, Syria and Palestine, all having presumably been inspired by or exported from Greece or Egypt. Within a hundred years after arriving in the area, Greek artisans were producing elaborately decorated silver alabastra, long and narrow and 12–16 centimeters (4.7–6.3 in) in height. The decoration usually involved dividing the body of the vase into four horizontal zones by ornamental bands around it. Wikimedia Commons has media related to Alabastra.